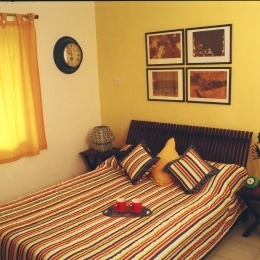 The air-conditioned bedrooms have double beds, soft linen, duvets and bathrooms with running hot and cold water. The fully equipped kitchen has a refrigerator, utensils, crockery & cutlery, just in case you feel like cooking a meal. The dining table seats four and the living room has a fold away futon which acts as an extra bed. A daily maid cleaning service ensures that you have a relaxing holiday. The complex has a swimming pool and the beautiful and peaceful Varca beach is just a short 500 meters walk from the flat.